Want to be notified of new releases in eueung/hugo-sp-minimal? Minimal is a theme developed by Steve Smith (orderedlist) and belongs the official themes used by the Github Pages automatic page generator. I used the theme for many of my course pages, because it is simple and elegant. 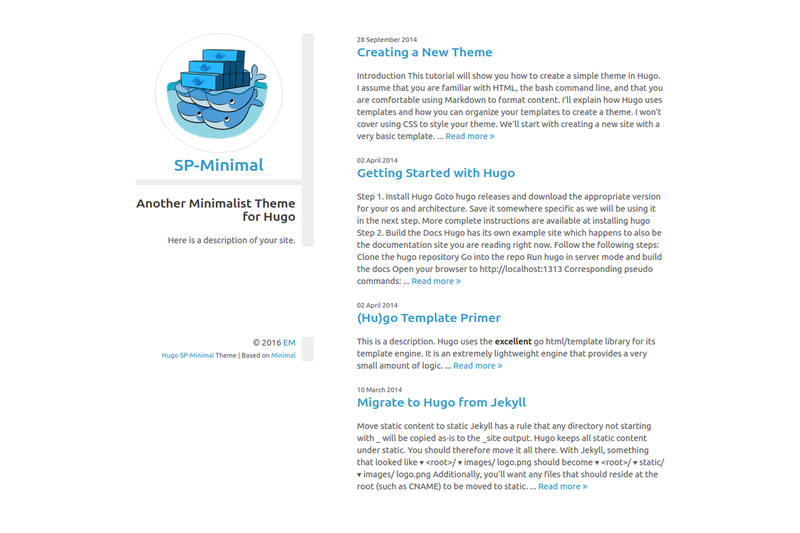 SP-Minimal is a port of the theme for use within Hugo. The theme supports single- and multi-page rendering, code highlighting, Disqus comment system and Google Analytics. The following config.toml is used for the demo site mentioned above (multi-page). Please note the line renderType = "multi". Content must be of type post. For details please look at the exampleSite/content/post folder. subtitle    = "Another Minimalist Theme for Hugo"
copyright   = "Released under the MIT license." description = "Here is a description of your site." pageNotFoundTitle = "404 - Page not found"
For single-page rendering, renderType must be changed to single. Content must be of type onepage. You might just put your markdown file(s) inside exampleSite/content/onepage folder.